When I saw Ed Berger a couple of weeks ago, I told him, "I want to talk to you about Benny Carter sometime, I don't know his work the way I should." I'm frankly bowled over that Ed sent me a copy of the massive two-volume study, Benny Carter: A Life In American Music. Ed's father Morroe began the process and the first edition came out in 1982, by which time Ed was Benny Carter's road manager. Every time I've seen the revised and expanded 2001 edition (credited to Morroe Berger, Ed Berger, and James Patrick) I've said to myself, "Someday…"
Turning a few pages tonight I can already see that Benny Carter: A Life In American Music lives up to its reputation as one of the greatest jazz books. Ed also included a couple of late Carter CDs on the Evening Star label. 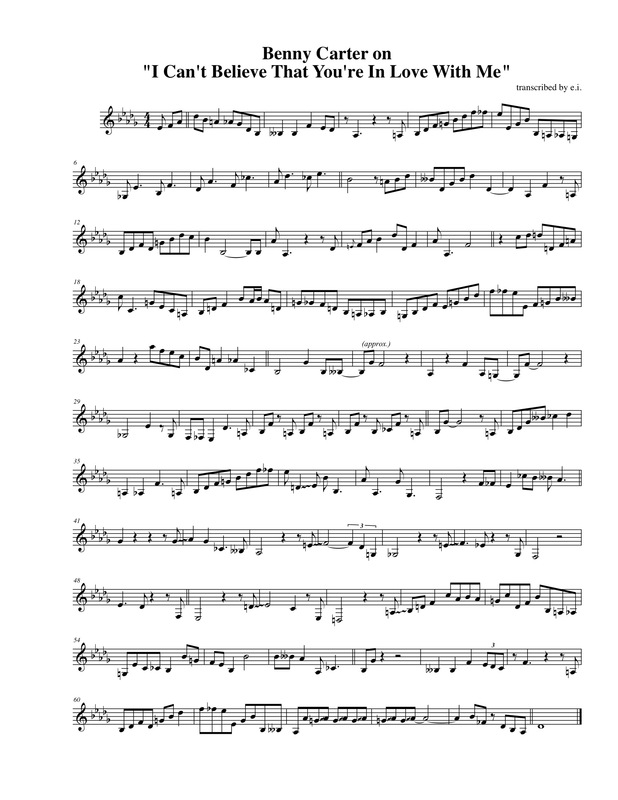 To celebrate receiving all this bounty, I transcribed a famous Benny Carter solo. This is in 1940, from the "Chocolate Dandies" session with Coleman Hawkins, Roy Eldridge, Bernard Addison, John Kirby, and Sid Catlett. Hawkins plays great, Eldridge plays even better, but Benny Carter trumps them both with this futuristic monster. It's Lee Konitz's favorite Carter solo. The only three albums by Benny Carter I owned before today are splendid. Further Definitions is an important library staple with a magnificent performance by Jimmy Garrison. (Back to the future: Garrison is tethered to Jo Jones.) Central City Sketches is probably Carter's most famous album from the late years. And right now I'm spinning Count Basie's deeply swinging Kansas City Suite from 1960, composed by Benny Carter. Colm "Red" O'Sullivan, another authority, tells me I must hear Gillespie/Carter Inc. from the 70's on Pablo. I have mixed feelings about Pablo dates but if Red says it's great I gotta check it out. And from the Berger book I'm eyeing trio and quartet sessions with Teddy Wilson, Earl Hines, and Jimmy Rowles. Not to mention these two Evening Star CDs… Thanks again, Ed!